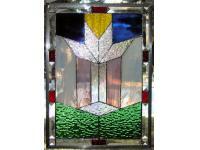 Rectangle panel of clear, blue, green, white, yellow and red glass with bevels for accent. 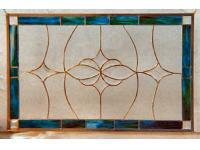 Rectangle window panel made using bevels, blue green and clear assorted textures of glass. 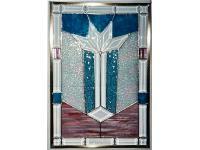 Rectangle window panel of pink, blue and clear glass is high lighted by bevels. 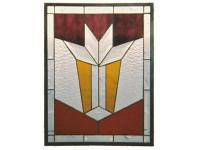 Rectangle window panel of red, gold and clear glass with bevel accents.